So 2 weeks ago I spent 9 days in Cyprus. It was a place I had wanted to visit when I was in Saudi Arabia last time, but never had the chance. 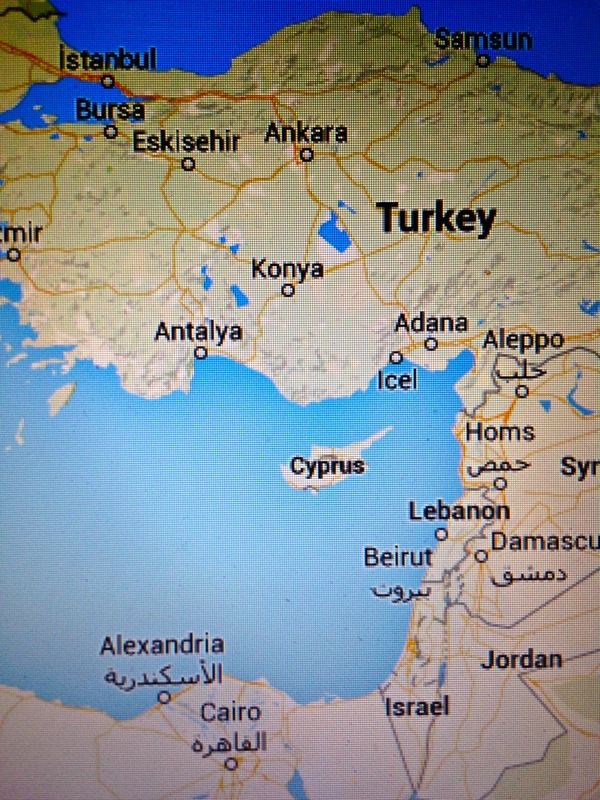 Cyprus is an island in the Mediterranean Sea that neighbours Turkey, Syria, Israel, Lebanon, Egypt and Greece. Even though it is geographically close to these conflict areas, the island itself is actually quite safe. Petty crime and such are said to be on the rise related to recent economy issues. Its economy (at least in the southern part) is largely tied to Greece. Cyprus has a sorted past. In the early 1900s it was a crown colony with ties to Britain. In 1960 it became the Republic of Cyprus and the government at that time needed to allocate a certain percentage of its seats to Turkish Cypriots. This led to internal strife between the Greek Cypriot majority and the Turkish Cypriot minority, so in 1964 UN peacekeepers were brought in. They are still in place. As a side note, we actually met a group of them out at a pub while we were in Nicosia. In 1974 Turkish forces invaded the northern part of the island, resulting in the displacement of huge numbers of Cypriots. It’s understandably been a point of contention ever since. Well, at least for the Greeks. Most of the Turkish we spoke to had no bad feelings towards the Greeks, and the word “peace” was mentioned several times. We met several people on both sides who’s families were greatly affected by the 1974 invasion. Our Airbnb host in Limassol’s family lived in North Nicosia, but was originally from Greece and so her family lost the home they owned and essentially had to start over. Same goes for a cafe owner we met in North Nicosia. His family was Turkish but had owned property in the south which they lost and had to start over on the Turkish side. Even though these events happened 40 years ago, for many people it is like it was yesterday. Spending time here made me reflect on how hard it is to imagine what it would be like to lose your house, possessions, neighbours, your whole life really, overnight. What it would be like to be striped of all your worldly possessions and having to start over. After the 1974 Turkish invasion a UN Buffer Zone was established and monitored by UN peacekeepers. This basically entailed the formation of the Green Line which stretches 180km across the northern part of the island. It dissects through the capital city Nicosia. The border remained closed until 2003 when Greek Cypriots were allowed to cross into the north. I really loved the city of Nicosia, and we crossed into the north via the Ledra Street crossing several times during our stay there. This was an interesting experience as you walked through the DMZ (demilitarized zone or Green Line) to get back and forth. We were given a map of Nicosia at our hotel in the southern part of the city and it was very intriguing as it was basically blank on the map once you crossed into the north. All that was noted was that it was Turkish occupied territory since 1974. No street names. It reminded me of how I once bought a world map in Saudi Arabia and the country of Israel wasn’t identified. It was just left blank, almost as though it also didn’t exist. Hello there!! 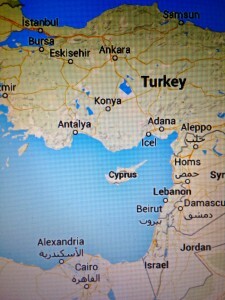 I’m back in Riyadh after spending 10 lovely days outside of the “sandpit” in Cyprus (more to come on this later!) . It was a much needed vacation, and it was difficult to want to come back. One of the things that made it a tad bit easier to return was that my Kiwi travel mate and I had agreed to dog-sit for some friends of ours who live in an undisclosed location in the Diplomatic Quarter, and we would have free run of their place in exchange for watching their 2 precious terriers. The Diplomatic Quarter (DQ) is a secured area in Riyadh housing over 100 foreign embassies and consulates, as well as schools, stores and housing. There are secured gates to get in and out of the DQ with armed Saudi military patrolling the entrances and within the DQ itself. It’s like a different world in that women don’t have to wear an Abaya when out in public here and it has more of a western feel. Not western enough mind you that women are allowed to drive, but it does provided a taste of western freedom that many expats are accustomed to. The place we are staying is palatial compared to our 1980’s shared accommodation provided by our hospital. It’s a 3 bedroom, 3 storied villa, with a lovely outdoor area and a BBQ that I’m pretty jazzed to grill a New Zealand steak on later tonight. We have an amazing security system with street view cameras and a “safe haven” in the event of intruders. One of the great things about the DQ is the abundance of park areas. They are everywhere, and often very beautiful with water fountains and play areas for the kids. It’s been really lovely walking the dogs around the neighbourhood. They are a big hit. Even at the guard stations. The only down side of our dog sitting adventure is that we now have to commute to work instead of being able to walk to the hospital. This entails having a driver take us to and from our shifts at the hospital. Not being able to drive is often one of the most difficult things to living in Saudi Arabia. As a woman I am completely dependent on someone else to take me places. That means if they are late, you are late. If they don’t show up, you are stranded. It can be very, very frustrating. Let me describe yesterdays journey to you a bit. I start work at 7am, so normally leaving the DQ at 6:30 leaves plenty of time. My usual driver is home for the month in Pakistan so I’ve been using an Indian fellow. He was a little late. And then he said there was a lot of traffic on the side streets so the freeway would be quicker. As it turned out a camel would’ve been quicker. The freeway was basically a parking lot. The 4 lane freeway was packed at least 8 cars across everyone inching forward bumper to bumper. Some of the vehicles decided to pull the genius move of going the wrong way down the entrance ramp to take side streets. Others preferred to take the 4×4 option of jumping the curb and driving on the garden shoulder and bypassing the whole cluster!! Sadly, my driver was not up for an early morning adventure. So we sat. And inched forward. And sat some more. After 45 minutes I eventually made it to work. Oh wells…….. So that’s been my week. More on Cyprus very, very soon…..
I’m sure you are dying to know how the banking saga turned out. Well as of this afternoon I have a Saudi bank account. Yeah!!! I also have a multiple exit/re-entry visa, well, I will tomorrow after I print it off. This process of printing the visa out is different than the last time I was here. The lady at the passport office was getting exacerbated with me as she kept saying “you brint off goggle” (sidenote: many Arabic speakers have a hard time saying the letter ‘P’ and pronounce it ‘B’) anyways, over and over with a thick accent she said “goggle” pronouncing it as go-glah. After the sixth attempt of her thinking I was a complete idiot it registered. Google. Duh. By this time Thursday I’ll be sipping some legal beverages and toasting my freedom looking out at the Mediterranean. See ya’ll in a couple weeks!